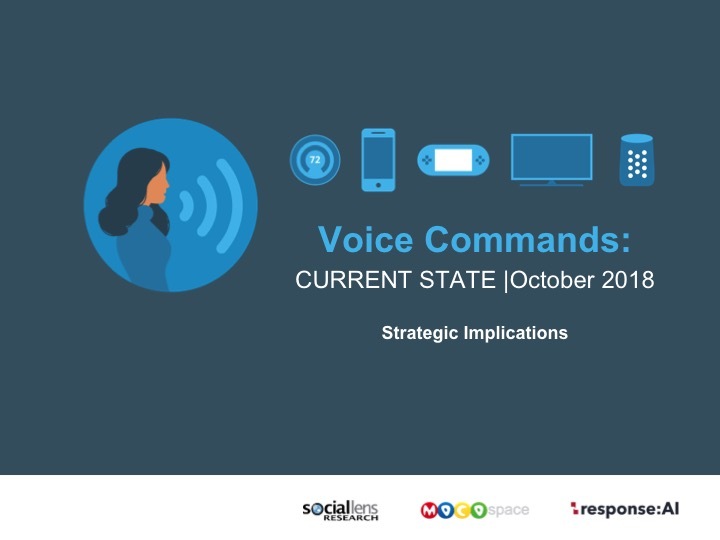 Our most recent study, Voice Commands: Current State October 2018, highlights a growing use of voice commands today and the potential for exponential growth. 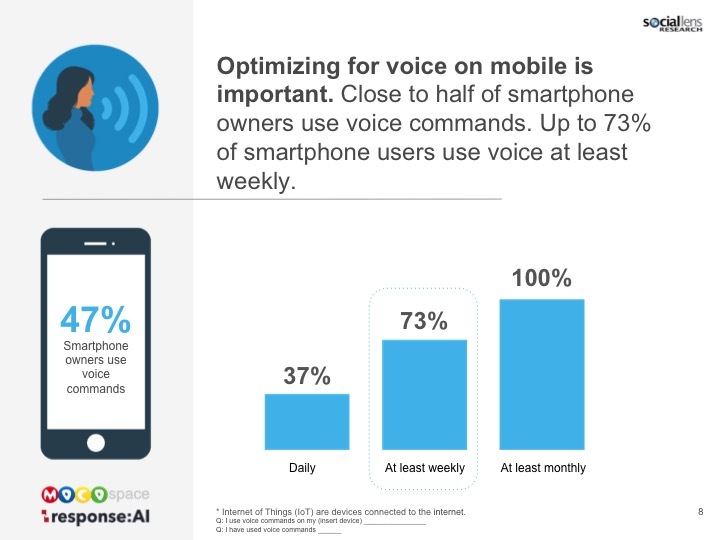 Easier to use, higher quality voice experiences are essential to capturing market share, especially for industries that are currently being found through voice command. 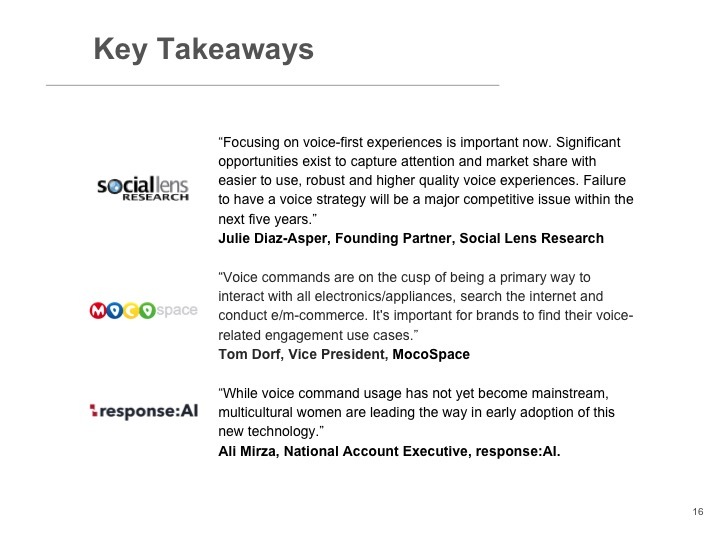 Developing higher quality voice experiences for consumers will be essential for companies to stay competitive in the next five years. 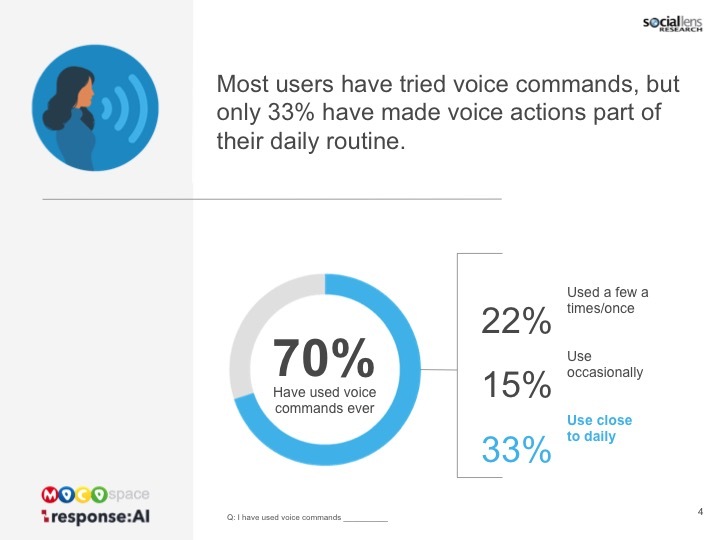 Although voice command usage is still in the early days, voice commands are a critical part of the mobile experience. 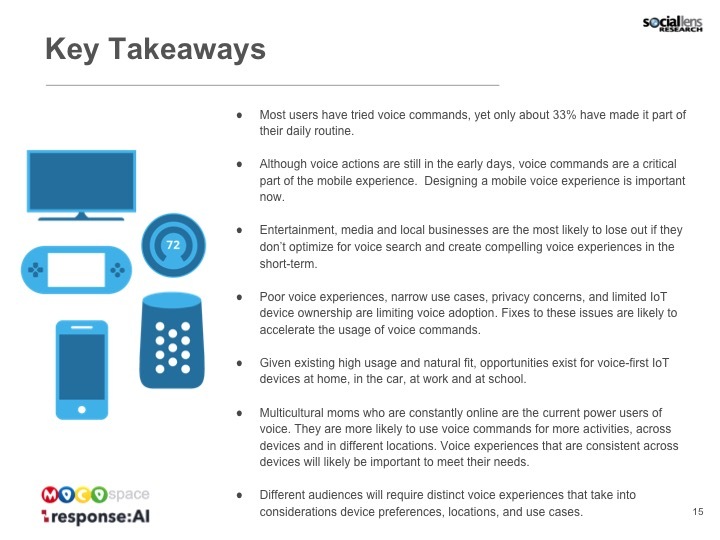 Designing a mobile voice experience is important now. 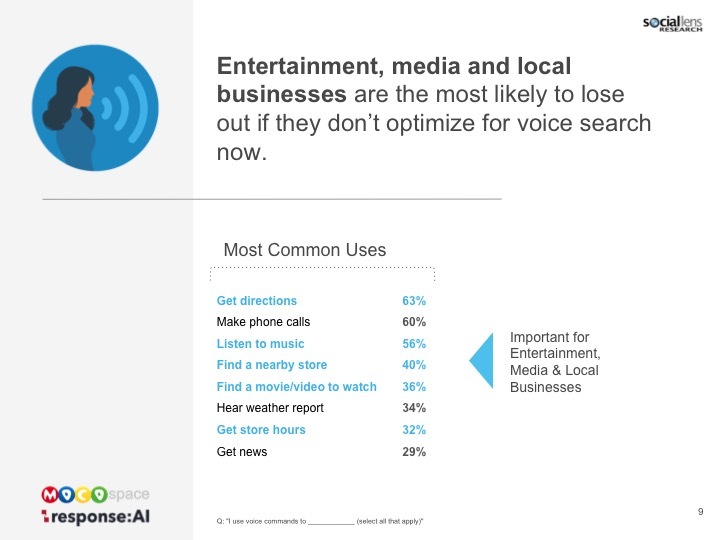 Entertainment, media and local businesses are the most likely to lose out if they don’t optimize for voice search and create compelling voice experiences in the short-term. 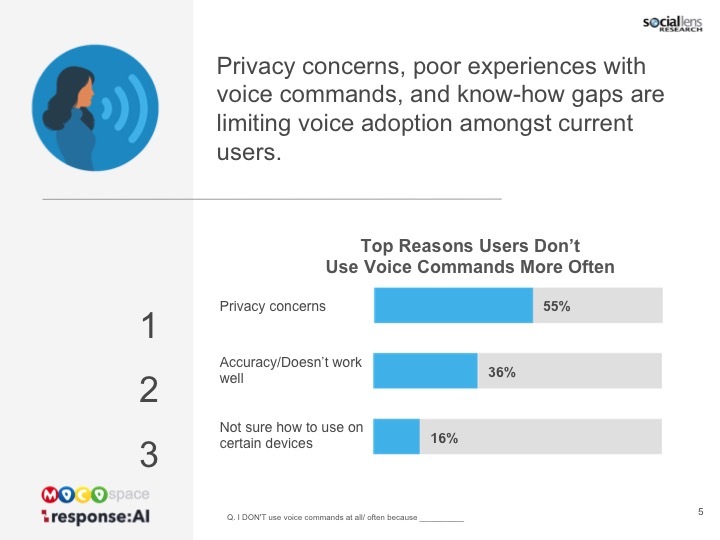 Poor voice experiences, narrow use cases, privacy concerns, and limited IoT device ownership are limiting voice adoption. 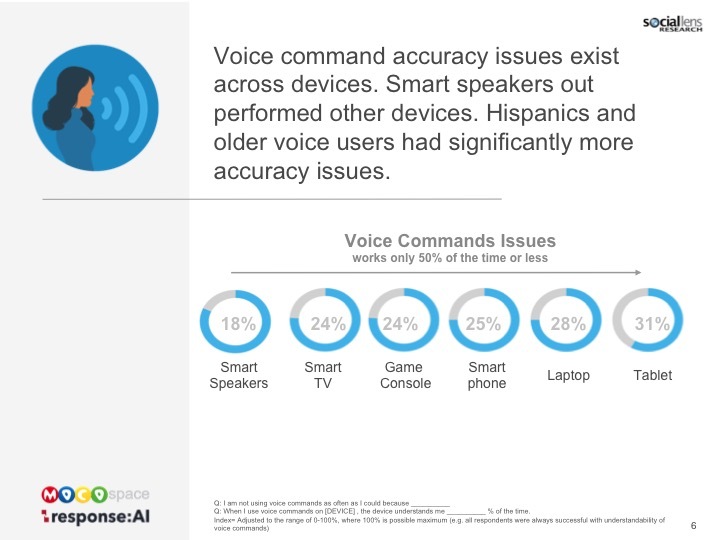 Fixes to these issues are likely to accelerate the usage of voice commands. 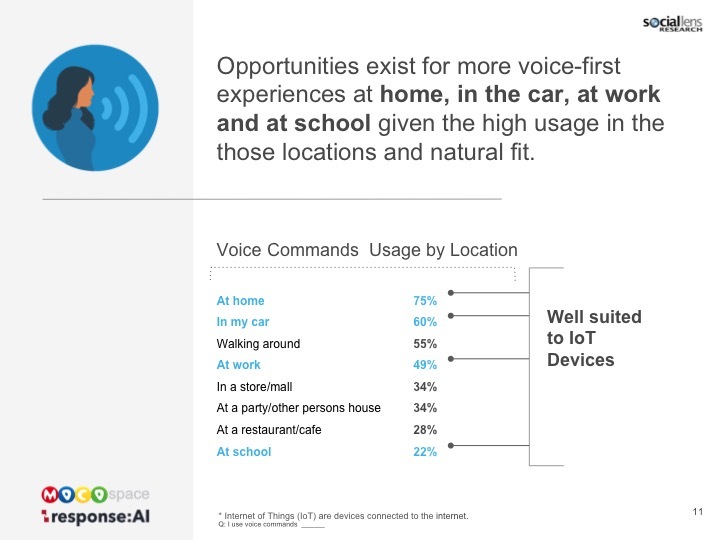 Given existing high usage and the natural fit, opportunities exist for voice-first IoT devices at home, in the car, at work, and at school. 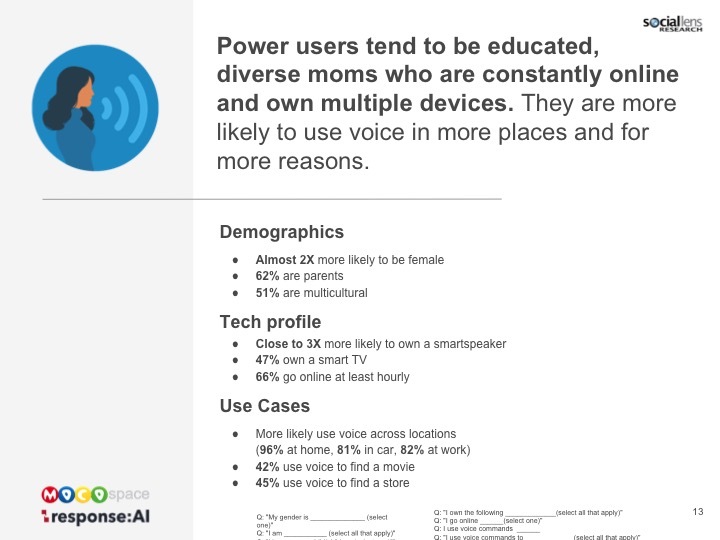 Multicultural moms who are constantly online are the current power users of voice. 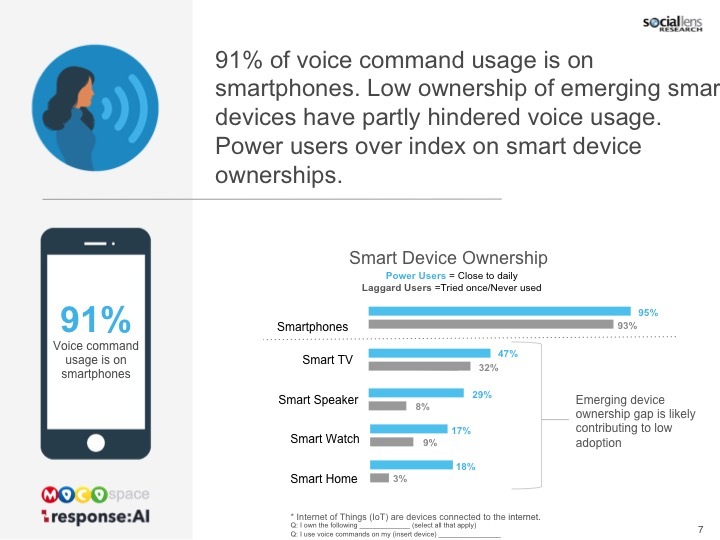 They are more likely to use voice commands for more activities, across devices, and in different locations. 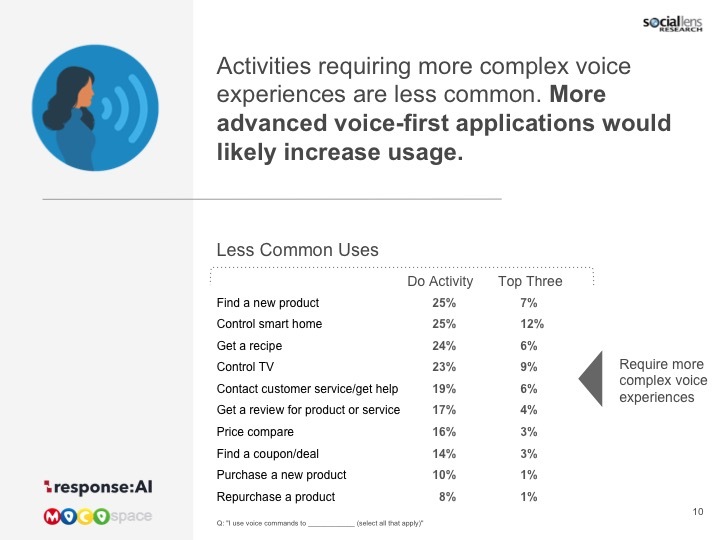 Voice experiences that are consistent across devices will likely be important to meet their needs. 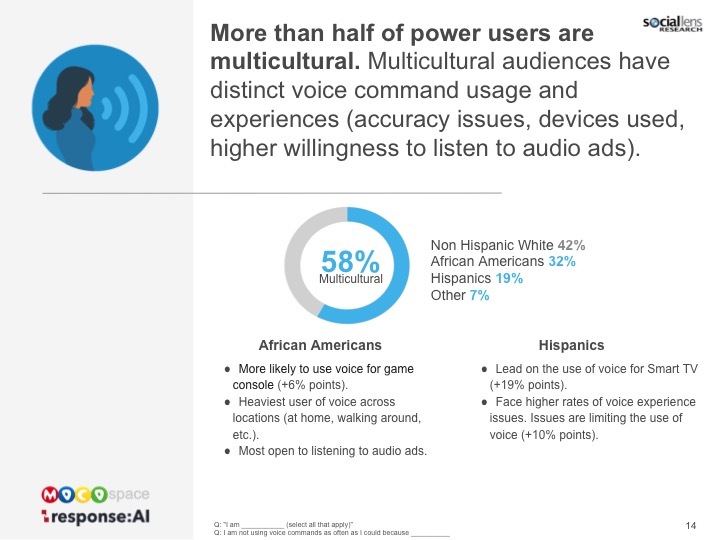 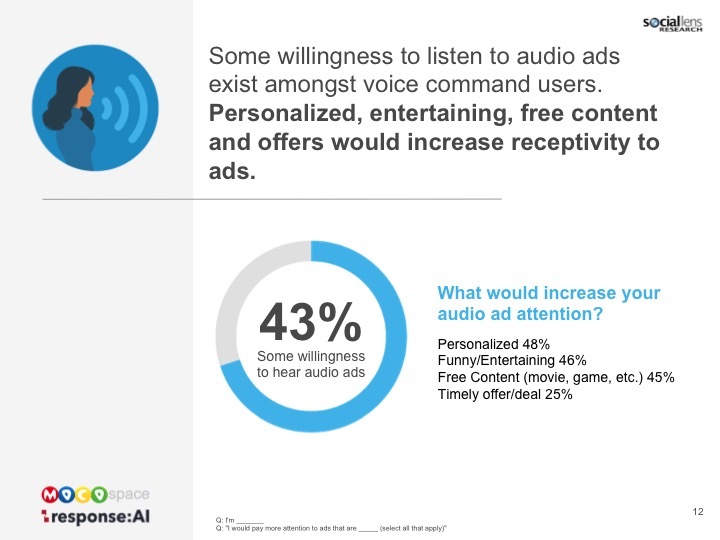 Different audiences will require distinct voice experiences that take into considerations device preferences, locations, and use cases. 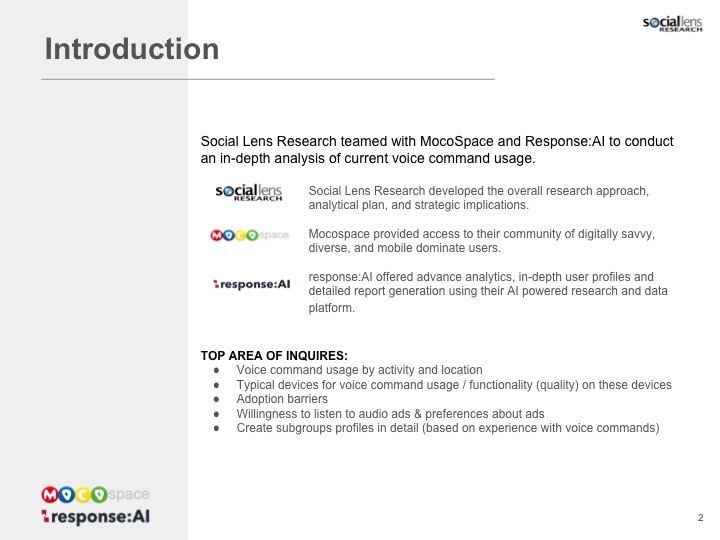 Social Lens Research teamed with MocoSpace and response:AI to conduct an in-depth analysis of current voice command usage. 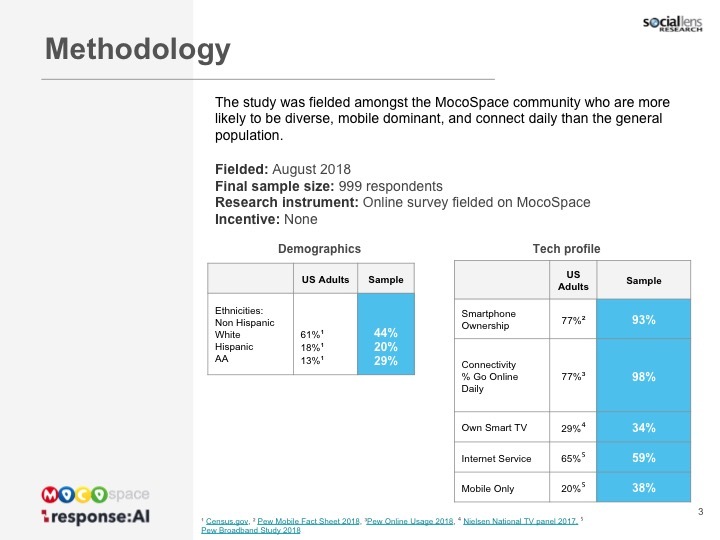 The study was fielded among the MocoSpace community, who are more likely than the general population to be diverse, mobile dominant and connect daily. 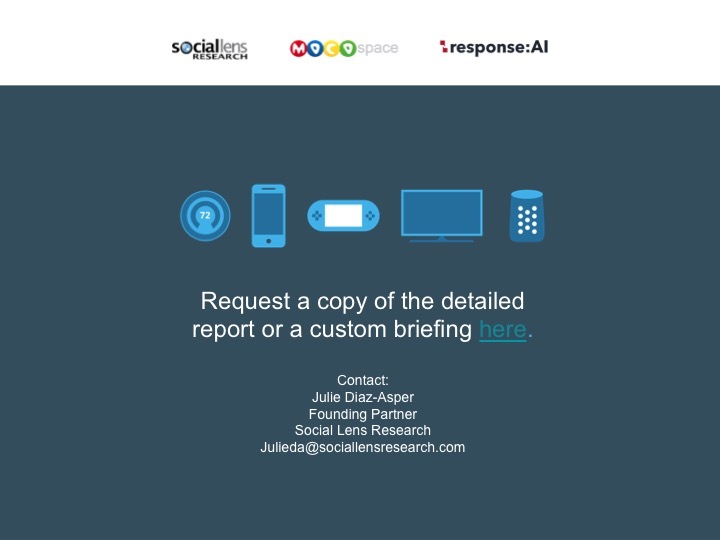 The MocoSpace community offers a representation of early adopters and the future adoption of emerging technology.